FILE - Supporters of Edgar Lungu, leader of the Patriotic Front party (PF), gather during a rally in the capital, Lusaka, Zambia, Aug. 10, 2016. Zambia's main opposition, the United Party for National Development (UPND), plans to petition the Constitutional Court on Friday regarding the outcome of the August 11 presidential poll won by incumbent President Edgar Lungu. The UPND also aims to stop the official installation of Lungu, which has been scheduled for next Tuesday. The Electoral Commission of Zambia declared Lungu the winner of the presidential election with 50.35 percent of the total votes cast, while the main opposition leader, Hakainde Hichilema from the UPND, garnered 47.67 percent of the votes. A new constitutional requirement states that the winner of the election must attain more than 50 percent of the votes. Previously, a winner could be declared with less than 50 percent. UPND spokesperson Charles Kakoma told VOA the opposition party has evidence proving the presidential election was rigged. 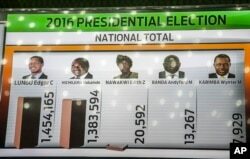 A tally board shows updated results of the presidential elections at the electoral results centre in Lusaka, Zambia, Aug. 15, 2016. "There are a lot of irregularities that were discovered in the electoral process, as well as deliberate mistakes by the electoral commission of Zambia,” Kakoma said. “They manipulated a lot of figures, which they gave to the sitting president to make him win, and we think that is wrong and it should not be allowed." The UPND hopes Lungu would not be installed until the party's legal challenge at the Constitutional Court is resolved. Kakoma says other opposition parties support the UPND's position. Supporters of the ruling PF say the legal challenge is unlikely to succeed because both local and international poll observers declared the August 11 poll as free, fair, transparent and credible. A court rejected the UPND's legal challenge seeking to prevent the electoral commission from announcing the results of the presidential vote. "There is a constitutional provision that when there is an election petition, the president-elect should not be sworn in,” Kakoma said. “But, we are also confident because the amount of evidence that we have gathered and the documents is so overwhelming that any reasonable court will agree with our argument. "The international observers did not see everything that was going on,” he added. “For example, we caught somebody in the Electoral Commission of Zambia's computer room trying to manipulate the results. And the deputy director in charge of information technology has since been arrested, and the international observers might have missed that. So they were hacking the electoral commission and manipulating the results, so the results that were coming to the totaling center — where the international observers were — had already been hacked and manipulated. They would not have noticed that."